South Burnett’s 2017 Citizen of the Year Elaine Madill has added another award to her name … this time an Order of Australia Medal in the 2019 Australia Day Honours. Elaine has been recognised for her volunteer work in the Wondai community, especially with the Wondai Art Gallery. This is the second OAM given to a Wondai citizen within six months; in June, South Burnett Race Club president Roy Radunz received the same award in the Queen’s Birthday Honours. Elaine told southburnett.com.au the fact that two Wondai residents had been given awards in such a short period said a lot about the community spirit of the town. She said Roy and herself were “just the lucky ones” to be recognised but the whole community should be proud of what they do in the town. “We are a unique community,” she said. Elaine said she had gained more back from her volunteering in the Wondai community than she had given. “I thank the people of Wondai and I assure them that I will make full use of the award,” she said. Elaine has served as president and curator of the Wondai Art Gallery for may years, a role she will relinquish at the upcoming AGM of the association. However, she won’t be severing ties with the gallery as she will be putting up her hand for the vice-president’s position. Elaine retired to Wondai about 16 years ago from the Gold Coast. Her husband, Noel, had died several years earlier and her three children were all adults. She had already fallen in love with the South Burnett region during regular trips with friends to Bjelke-Petersen Dam over the years. “Mum had died, my sister had died and I sold my home on the Gold Coast at the top of the market. I invested in my superannuation and retired up here,” she said. She looked around for a house in Wondai but at the time there was nothing suitable available. Then she spotted “For Sale” signs on the fence of a house in Tingoora. “I walked in the front door, then walked out the back door and saw the garage and the garden, and I bought it with a handshake,” she said. Within three years of her arrival, Elaine had become president of the Wondai Art Gallery. In 2011, she was awarded the South Burnett Australia Day Cultural Award, followed in 2015 by the South Burnett Award for Wondai. She also was awarded a prestigious Individual Volunteer Award from Gallery and Museum Services Queensland in 2011 for her work with the gallery. Elaine has also been active in other parts of the Wondai community, including the local Catholic parish and an interfaith group that organises the annual World Day Of Prayer celebration. She also established the “Wondai Ladies Lunch”, a social group for local women who meet monthly to enjoy lunch together. “We haven’t missed a month since we started in about 2003,” Elaine said. In August 2016, Elaine’s world came tumbling down when she suffered a stroke. She was able to continue living in her Tingoora home but – thinking ahead before the medical crisis occurred – she had placed her name on the waiting list for a unit in The Laurels at Wondai. The stroke accelerated her placement, and she moved into her new home in November that year. Months of rehabilitation followed, but Elaine kept her connections with the Wondai Gallery throughout and continued working behind the scenes. 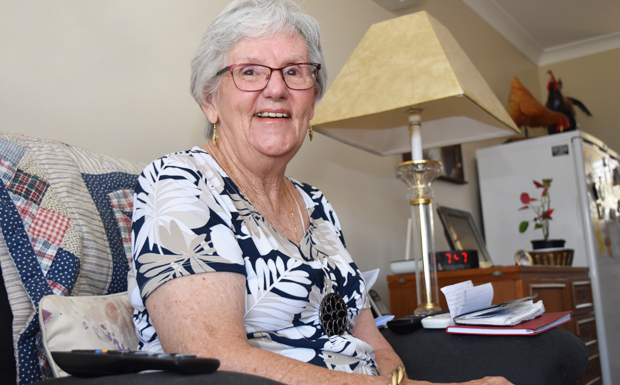 Elaine now hopes to use her OAM to help highlight some of the difficulties that people who suffer strokes and other injuries encounter in regional areas, in particular accessing occupational therapy and other rehabilitation services. Congratulations Elaine, a well deserved award! !